Looking for a Chanel boutique? Hermes? Balenciaga? Herve Leger? Outside of Los Angeles/Beverly Hills, Las Vegas and New York City, the only U.S. stores for these and many other designers are here at South Coast Plaza. Minutes from central Irvine, South Coast Plaza is the premiere luxury shopping destination of Irvine and Orange County. 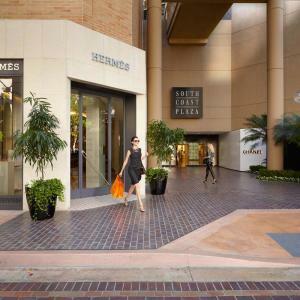 Visitors from around the world know South Coast Plaza for its 30 restaurants and 250+ shops and galleries, including the hottest names in fashion and prestigious designer boutiques, otherwise found only in "world cities" like New York, Paris and London. In fact, South Coast Plaza houses so many famous names and brands, one city block doesn&apos;t contain it. The opulent main center is connected to a second mall west of Bear Street via the pedestrian-only "Bridge of the Gardens." To the north, across Sunflower Avenue, South Coast Plaza Village is home to a cluster of specialty shops, galleries and restaurants, and to the east, the Unity Bridge over Bristol Street links South Coast Plaza shopping to the theater complex of the Orange County Performing Arts Center. South Coat Plaza is located in Costa Mesa, minutes from central Irvine, just west of the Costa Mesa Freeway/Highway 55 and north of I-405 by way of Bear Street. For additional information, contact Guest Services at (800) 782-8888.